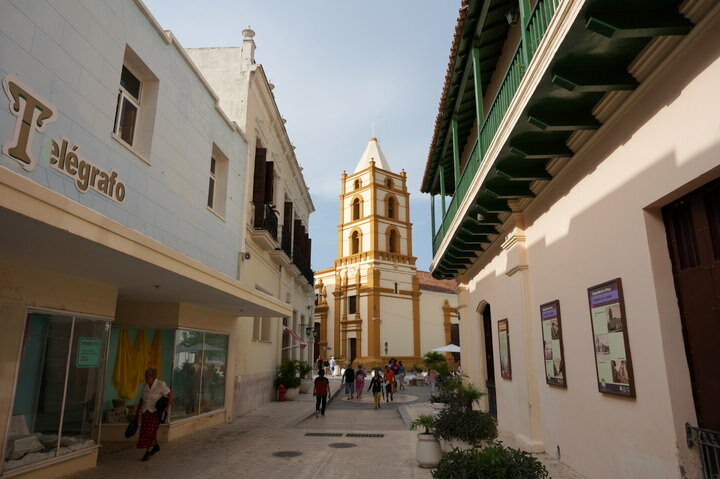 Unless you’ve been travelling in Cuba, or researching a trip to the Caribbean island, you probably have never even heard of Camagüey, which is known for its maze of alleyways, Spanish plazas, performing arts and numerous cathedrals. After reading about how the city was continuously attacked by pirates, and how the labyrinth of streets is often compared to the medinas of Morocco, we were intrigued. 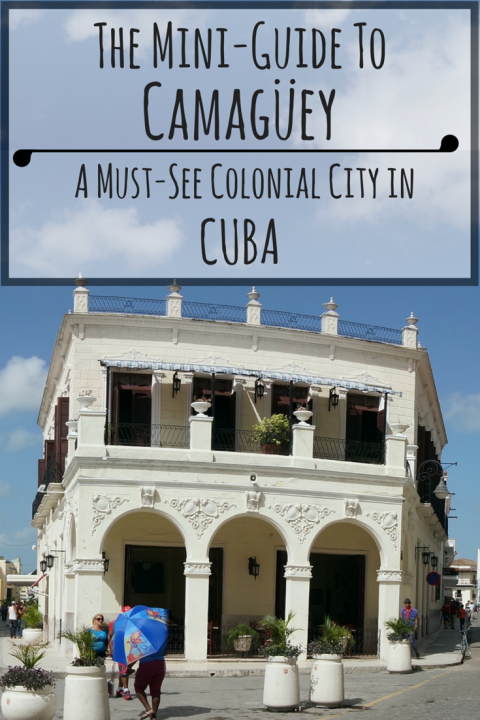 We immediately placed Camagüey on our Cuban itinerary and are so glad we did! 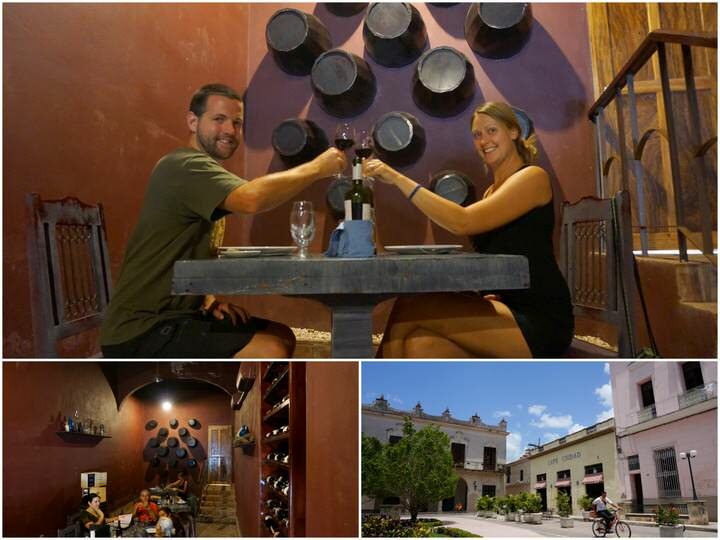 Here’s a mini-guide to show you the highlights, where to eat and where to sleep in Camagüey. This gothic, triple-spired cathedral has a different style to most other cathedrals in Cuba, it looks like it belongs in Europe! This church dates from 1748 and has an active convent attached to it. With a 2 level arched interior, creepy catacombs and a solid-silver coffin, this is a must-see in Camagüey. Many streets lead to this small intersection, which has some good eating spots, hotels, and this beautiful, newly renovated church. Most of the Spanish colonial cities are designed in a grid-like pattern. Camagüey’s streets however, are wonderfully abstract, with tangled alleyways leading to small plazas all over the city. Exploring any of the back streets outside of the popular squares will reveal some interesting gems. You’ll find friends and families having block parties, kids playing baseball, people sitting on steps watching the world go by, and vendors walking around selling various goods. Bring your camera and explore. A man sits on his front step, taking a break from delivering goods. The tangle of alleyways reveals interesting sights. 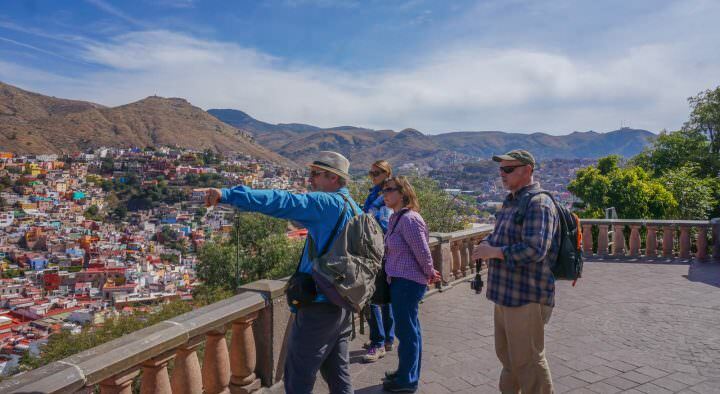 Plazas are where people get together to mingle with friends, where kids run around playing, and where you’ll often find live music and great eateries. Every city in Cuba (and every Spanish city), has plazas, and the ones found in Camagüey are lovely. This plaza is known as being Camagüey’s most picturesque and beautiful corner. There are numerous restaurants surrounding the square, however, we found them to be overpriced and not very good. Plaza San Juan de Dios in the late afternoon. This square is in the heart of the city and, due to its many trees and great seating, it’s a popular place to spend the afternoon. If you’re lucky, you’ll be able to see a musical performance here in the evening. The buildings surrounding this plaza are gorgeous and the location is perfect. 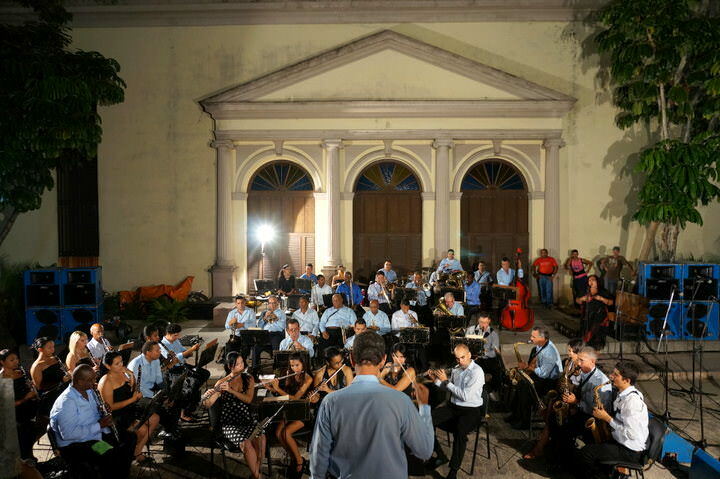 Symphony playing in Parque Ignacio Agramonte. This stunning plaza opens up at the end of a narrow pedestrian street which is lined with pastel-colored colonial homes. 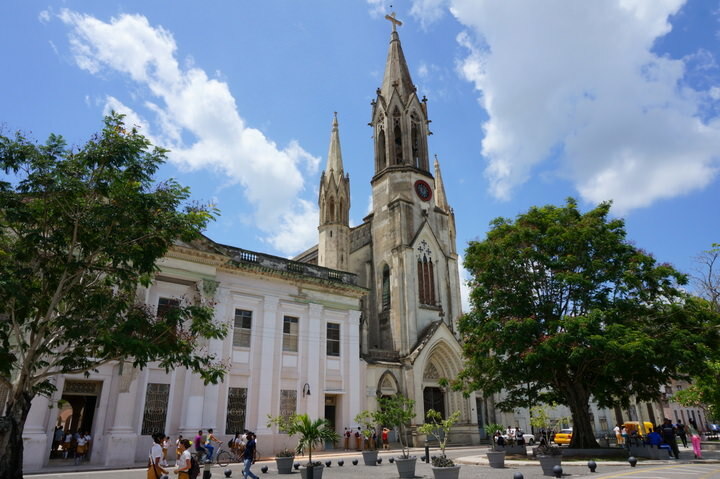 Here you’ll find some sculptures, the Iglesia de Nuestra Señora del Carmen church, and classic Camagüey stylings. Contrary to belief, the food in Cuba isn’t awful! We had some great meals while in Camagüey, and as an added bonus, the food was very affordable. This city had the cheapest food and booze out of any of the cities we had been to so far in Cuba. We could spend the whole day eating and drinking, if we felt like it, and still have a large portion of our Cuba budget left over for transport, entertainment and other things. At first, you may be uncertain if this dark looking restaurant is actually open, but once you push open the doors, you’ll be pleasantly surprised. Located on theatre street, this small eatery keeps the theatrical feel alive by giving you the impression that you’re eating in a cinema – check out the director’s chairs, the clapperboards and the photos of actors on the walls. The Italian style food here is tasty, the portions are huge and the prices are good. A margarita pizza is $2.35, spaghetti bolognese is $2.60 and bottles of wine are from $10. Isabella restaurant was fun and very affordable. Located in the Parque Ignacio Agramonte, below the Cafe Cuidad, you’ll find this cool spot for lunch or dinner. The decor here is great and the service is professional. But the best part is that a bottle of wine costs around $10, and tapas range from $0.80 – $4.85. Main courses are between $2.85 – $18.50. Don’t miss the wine cellar restaurant! This restaurant is in a great location – just beneath the gorgeous Soledad Church on Calle República. Although the food is more pricey than other restaurants, it’s a good place to come for a cold beer and some appetizers. Also, there’s usually live music here at night. 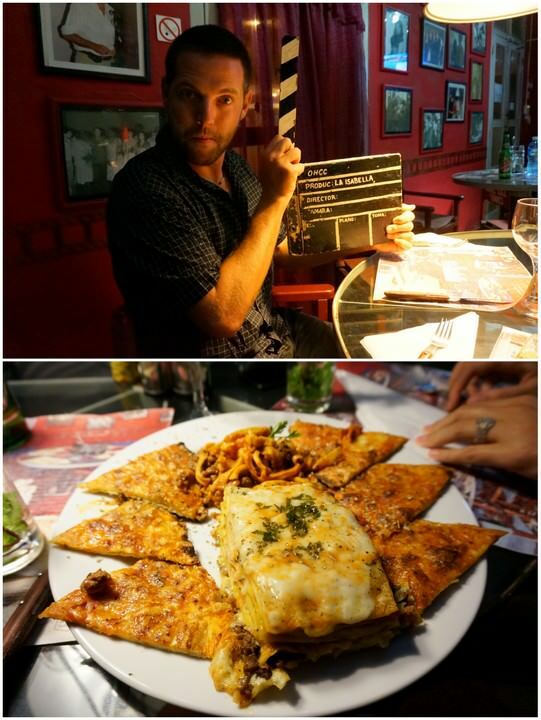 This restaurant is in a great location, and serves only beer and pizza. As a foreigner, you’ll be offered the “CUC” menu, which lists everything in higher prices than the local “CUP” menu. The food is the same, but the prices aren’t – ask to see the local menu. This is the place to try the local beer, Tinima, while in Camagüey. It may not win any awards for taste, but at $0.53 / bottle, you can’t go wrong! Don’t Forget Your Travel Insurance for Cuba! 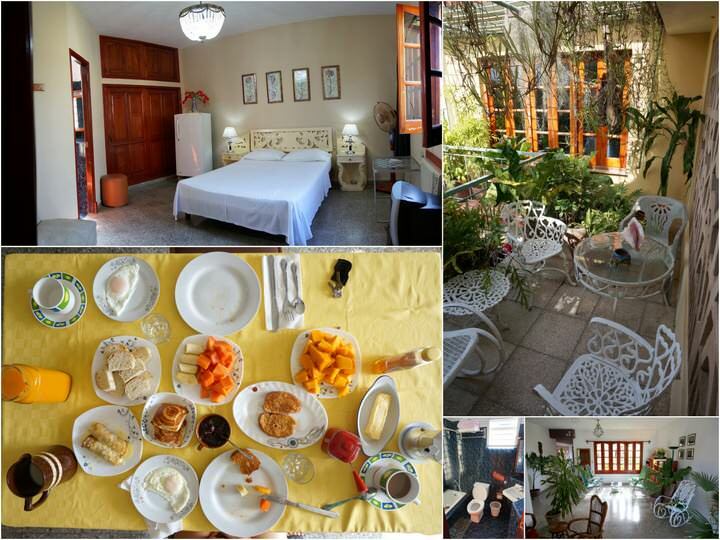 This casa particular is located just north of the city center, about a 20 minute walk away. We always prefer to stay outside of the busy part of town, and are happy we chose to stay here during our travels in Camagüey. The walk to the city center is an enjoyable one and it’s safe to walk home at night. However, you could always take a cycle taxi to and from the casa if you wanted. The room at Miriam’s was great, and the breaky was huge. Our room had huge windows (which let in a lot of natural light), a large bed, tiled flooring, a refrigerator, air conditioning and an attached bathroom, with a bath tub! A table full of food was served each morning for breakfast, and although we didn’t find Miriam herself to be the most outgoing person we had come across in Cuba, the room and location was one of our favourites. 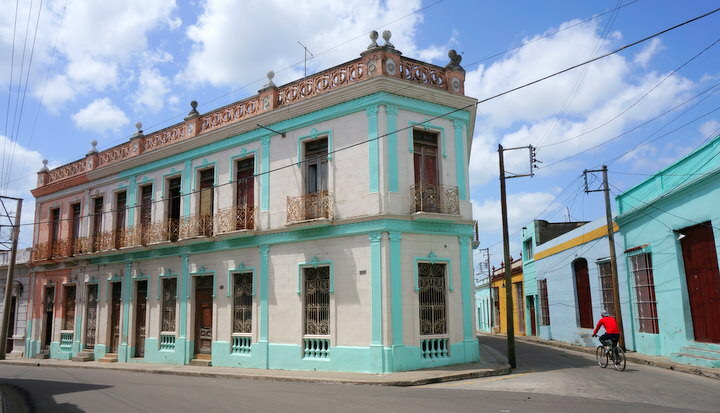 For more casa particulares in Camagüey, click here to compare prices on Airbnb. 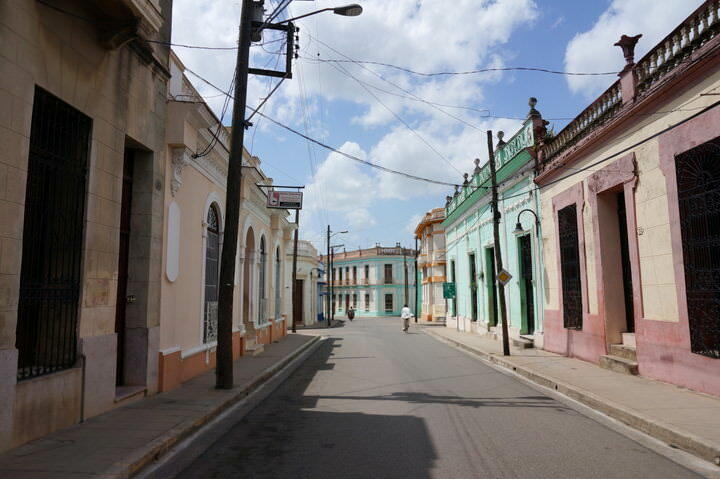 Despite what the guide books say, we found that there were far less touts in Camagüey. In fact, I don’t actually recall being asked if I wanted a taxi, tour, meal, etc. during our stay. What a breath of fresh air that was, especially coming from Trinidad where the hassle was insane. Cyclo-taxi rides in Camaguey were an enjoyable experience, with the correct (local) price being quoted to us right away. We rode past people who waved at us and had some good chats with our drivers. We were able to walk around uninterrupted and without feeling like a walking dollar sign. When we walked from our casa to the city center, people spoke with us (in their broken English and our broken Spanish) and were genuine. The city didn’t feel hectic, it was calm and relaxed. Empty back-streets in this part of Camaguey…no hassle here! 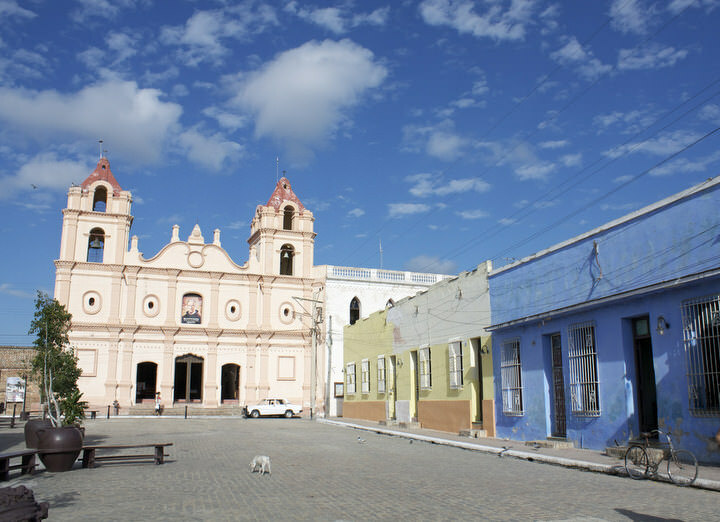 Most cities have one central area which has the largest amount of “must-see’s”, but Camagüey is different. Wandering from the center to the northern area of town, you’ll come across the Avenida de los Martires (Avenue of the Martyrs), which is a kilometer long street that is lined by old buildings with towering columned entrances! Heading towards the main center, you’ll find a kilometer long pedestrian-only street, Calle República. Walking from the center to the bus station, you’ll see many interesting streets, unusual buildings and a wide variety of shops. Areas and buildings that weren’t even listed as “sights” in our guidebook, were must-sees in my mind. The cathedrals, the pedestrian-only walkways, the plazas, the intriguing back-streets, the people and the restaurants were all fantastic! And on top of all of that, the costs in Camagüey were the lowest we had come across in all of Cuba. No matter which street you choose to take in Camagüey, you’ll find beautiful architecture, a friendly face and a fantastic restaurant. What?! After spending 3 nights in the city, we were left wanting more, and wished that we hadn’t booked our onward bus ticket so soon. 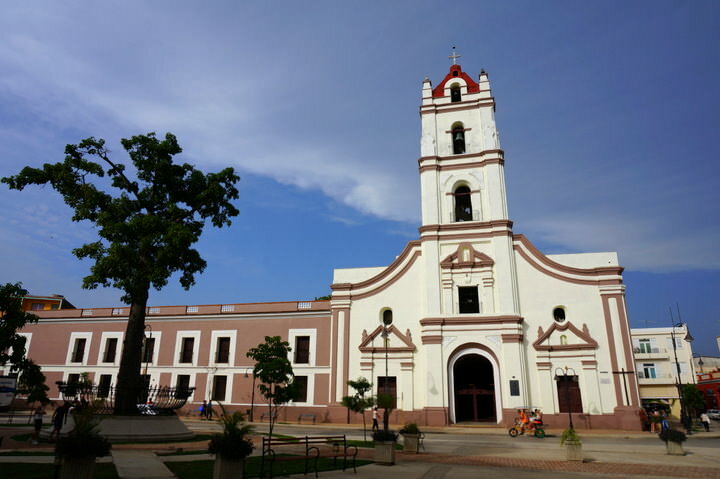 If you have the opportunity to visit Camagüey, take it, you won’t be disappointed. To get to Camagüey from Trinidad, the Viazul bus costs 15 CUC ($15) and takes 5 hours. Cycle taxis around the city cost 1 CUC. To go to the bus station, or to the northern part of the center, expect to pay 2 or 3 CUC. To get from Camagüey to Trinidad, the Viazul only has one bus, leaving at 2:30 am. 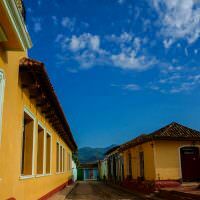 Since this is a ridiculous hour to get up and travel, we suggest taking the Viazul to Sancti Spiritus city, and then hiring a taxi to take you the rest of the way to Trinidad. The cost is very similar and you can sleep in until a reasonable hour. A bus to Sancti Spiritus is 10 CUC / person, and the private taxi is 30 CUC / car. Our taxi was a 1948 Plymouth! You can find the Infotur Office on the Theatre Street. It’s a wealth of information, and the people there speak English. Wi-Fi is available at the intersection of Calle Republica and Calle Agramonte, at the Hotel Santa Maria, located across from the Inglesia de la Soledad Church. Thank you for this article. 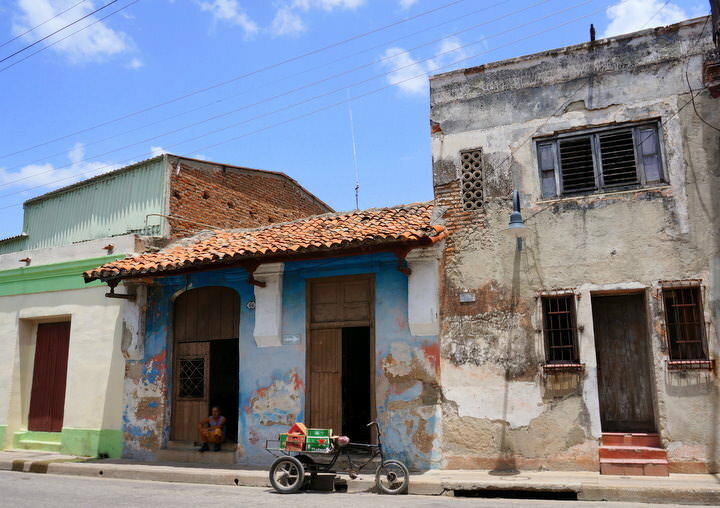 I had forgotten all about Camagüey and have no photographic material left from my own visit. It seems like you’re taking the classic roundtrip. Happy travels. Ya, the food was great! …and very cheap 🙂 Cuba was an awesome travel destination and Camaguey was a highlight for us. The more I read your posts, the more convinced I get that I would love Cuba! I travelled to Cuba as a backpacking student about 15 years ago. We were on a budget and couldn’t afford to eat in the resorts. The food I have to admit wasn’t great. I think what really put me off is seeing a meat delivery outside a restaurant. I won’t go into details but it was very hot, their were flies present, the truck had no refrigeration and their were stray dogs. Not a good mix. However, I didn’t go to Cuba for the food, I went for the adventure, the atmosphere and the experience. That it definitely has plenty of. Oh my goodness! What a unique little place I have never heard of! 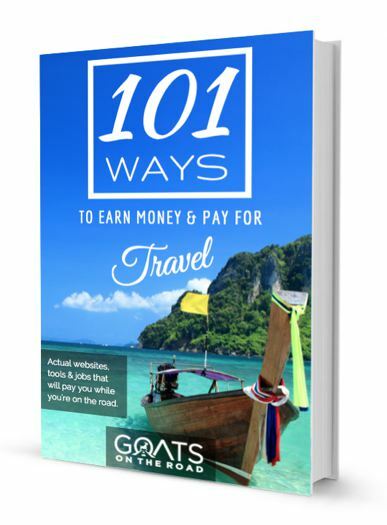 I just signed up for your backpack giveaway and newsletter. I love how easy to read your blog posts are and the amount of pictures! THANKS! Thank you Bobbi! Glad to hear it. I love your city guides! So comprehensive…and under $3 for a pizza? That’s awesome! Cuba looks like a great place to visit! 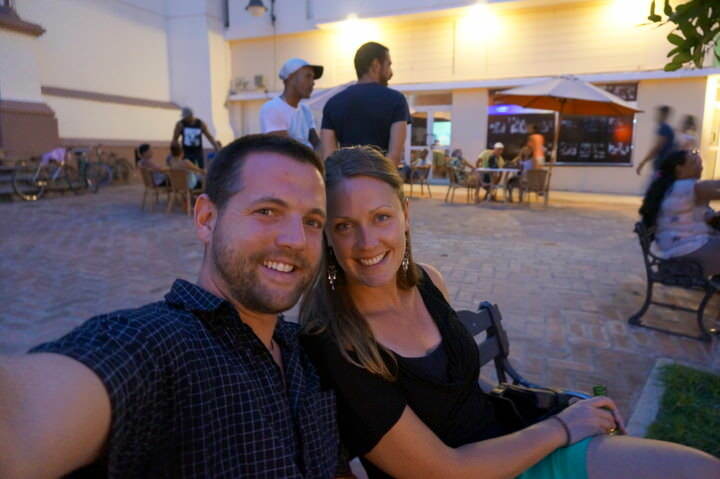 We really loved Camaguey in particular, but all of Cuba was awesome! I’m so jealous! I can’t wait to make it to Cuba. It’s been on my list forever, and now it’s finally getting more achievable. Thanks for sharing. It looks like you had an amazing trip. Can’t wait til our trip to Cuba. Thank you for doing all the research for me! 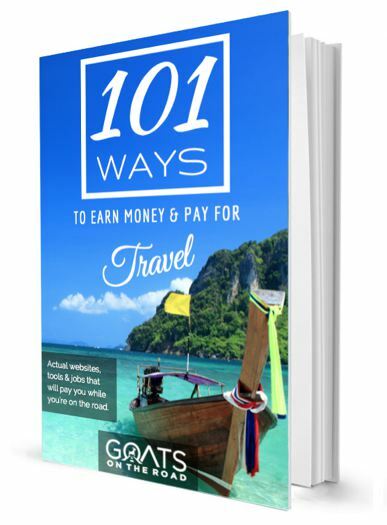 These guides have been very useful! I love that there’s a wine bar. Camagüey looks amazing. I really want to see Cuba before it gets ruined by the tourists. I look like it hasn’t moved into the 21 century. I love hearing about places outside of Havana! I’m planning my own trip to Cuba and this sounds like a nice addition to the “normal” trip that most people take. I love the smaller, off the beaten path places and this place looks beautiful. Plus, I’m going to need to eat at Isabella!! That plate looks amazing! 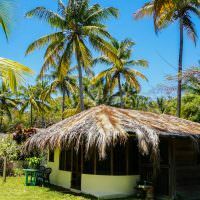 I’ve never considered putting Cuba on my bucket list — too many other places I still want to see, but you’ve at least proven it can be done, and safely too. I love your photos of different architectural styles and colors. Thanks Tami 🙂 We really enjoyed it there. The buildings are painted such bright colors! And Miriam House looks like a great place to stay! It’s so funny how people can have such different experiences in the same place. I guess its a good thing you didn’t listen to those people that didn’t like Camaguey! It sounds like a really quaint city. It is funny, isn’t it? I don’t know how people couldn’t like it?! 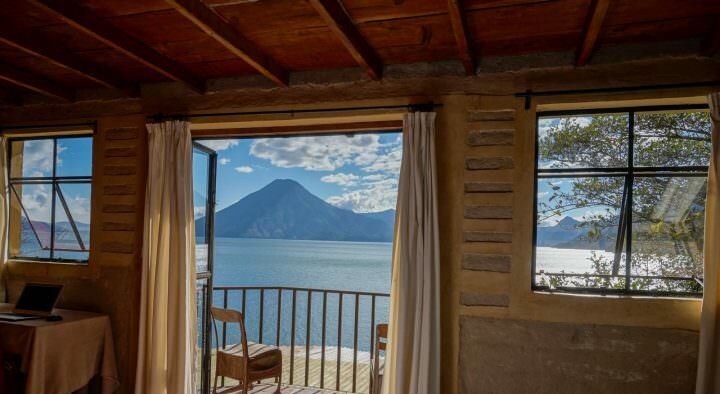 Definitely makes me want to go – WHAT a beautiful place! This brings back so many memories. I honestly had such an unforgettable time in Camagüey. There weren’t all that many tourists there when I visited in 2007, but I didn’t know the city wasn’t a popular Cuban destination. It’s such a great city, and I especially fell in love with the old buildings and of course being able to see Raul Castro speak was pretty much the coolest travel experience EVER! Great site! I’ve been to Cuba 2x in the past 6 months and will be returning with a friend in a couple of weeks. We wanted to visit Camaguey after Havana but have been struggling with the logistics within the confines of our schedule. If we do go, we will fly from Havana to Camaguey. Our plan was to travel to Trinidad from Camaguey, so your tip regarding the Viazul bus to Sancti Spirtus is very helpful. How long (time…not distance) is the drive from Sancti Spiritus to Trinidad? That answer will be a make-or-break for us. Just Googled it. Lol. 2 hrs. 43 min. Does that seem correct?